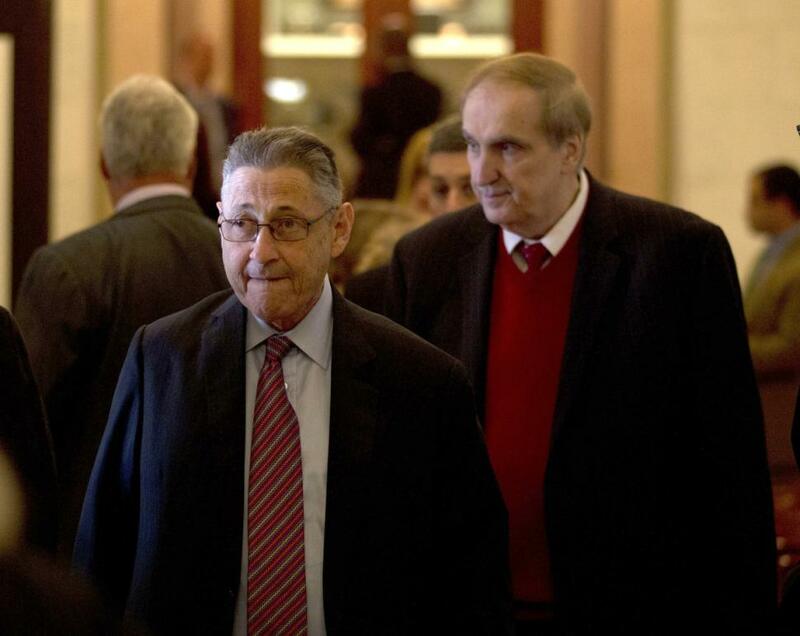 Sheldon Silver is on the way out, and that’s great! Pictured with Vito Lopez. Courtesy of the NY Daily News. Sheldon Silver is a bad Democrat and New York will be a better place with him out of politics. 1) For years he has colluded with Senate Republicans, drawing gerrymandered maps so he can run up the score on his enormous Assembly majority. In return, this has led to a Republican State Senate in a very blue state. Every time you hear about progressive legislation in Albany being blocked by Senate Republicans, remember how this majority came to be. Yes, Cuomo deserves blame for pledging to fight for a Democratic majority and then not doing anything about it, but Silver didn’t even bother with such a promise. 2) Silver’s iron-fisted rule of the Assembly is total. Members, even committee chairs, have no idea what bills are going to be passed until hours beforehand. Votes are generally unanimous. A low-level Silver staffer is far more influential than a regular Assemblymember, let alone someone who has crossed Silver in any way. When chatting over drinks, New York political insiders are in complete agreement that being an Assemblymember is a lame and demeaning job, and those who hold the office are viewed with either pity or disdain. 3) Silver kept a giant lot vacant in his Lower East Side neighborhood so that blacks and Latinos wouldn’t move into the neighborhood, an expose also brought to you by the Times. 4) Corruption ran rampant in the Assembly under his watch. Dozens of Assemblymembers were indicted. Silver’s chief of staff’s husband, a lifelong friend, was found hiding millions of dollars of cash from illegal kickbacks in his closet. Silver appointees protected Assemblymembers from sexual assault charges. I could go on. It’s disgusting. 5) Silver is credited by some for being liberal, but this is misleading. In an Assembly that hasn’t been close to turning Republican in decades, a liberal New York City Democrat would likely lead the caucus no matter what. What Silver often offers is liberal legislation that he knows will fail in the Senate, which, again, is Republican in large part because of his collusion. Shamefully, in 1999 Silver traded the commuter tax, an important revenue generator for New York City, so that he could pick up a handful of suburban seats to add to his enormous Assembly majority. I have also observed few people in politics better than Sheldon Silver at saying the right thing on an issue when he knows it won’t pass, only to wriggle out of it when the time comes to deliver. In no sense will his departure hurt the Democratic caucus or the cause of liberalism in New York State. Everything I’ve said has been known in New York’s political circles for years, but most elected Democrats are petrified of crossing Silver. Virtually no Assemblymember has ever stood up to Silver on anything. We’ll see how long the crickets last now. Just remember, the day it becomes clear that Silver is on his way out, you’ll hear a lot of people saying all the right things. To me, that’s the definition of cowardice. What makes the next few days interesting is that one of Silver’s hallmarks is to let any scandal roll of his back. He has two constituencies- his small, personally drawn Assembly district, and the Democratic caucus in the Assembly. A lot of old-timers in his district will not care. No other group of people affects him in the slightest. So will “progressive” legislators stand up? I spent 2013-2014 working as a special counsel to the New York State Commission to Investigate Corruption, also known as the Moreland Commission. We were tasked with investigating the flow of money in politics. Silver repeatedly denounced us as a “fishing expedition.” It’s a funny phrase to use. A fishing expedition is generally taken to mean “a search for information without knowledge of whether such information exists.” I think we all knew there were fishes, Shelley, and now maybe you’ll get to swim with them. Update: Paul Newell, a rare outspoken Silver critic for the past decade, has issued the following statement. If Newell were to challenge Silver in 2016, I would strongly support him. MAJOR update: The latest from the New York Times. This is wilder than anything I could have imagined. And I’m pretty imaginative. He is charged with mail fraud, wire fraud and extortion. The complaint maintains that for more than a decade, Mr. Silver devised a scheme “to induce real estate developers with business before the state” to use a real estate law firm controlled by a lawyer who had once worked as Mr. Silver’s counsel who orchestrated payments to the speaker for referrals to the firm. Prosecutors, according to the complaint, said that Mr. Silver did essentially no work for the payments.